(TibetanReview.net, Dec12, 2017) – In an unprecedented move and a worrying development for India, China is reported to have permanently stationed up to 1,800 troops in Doklam, near the Sikkim-Bhutan-Tibet tri-junction. India recognizes Doklam, claimed by China as its territory, as part of Bhutan and of strategic concern to it. The two were involved in a serious eyeball-to-eyeball, 73-day confrontation over Jun-Aug this year. The Chinese are reported to have built two helipads and installed scores of pre-fabricated huts, shelters and stores at Doklam, though not at the site of the confrontation with India. Besides, existing roads have been relaid, reported The Times of India Dec 10. 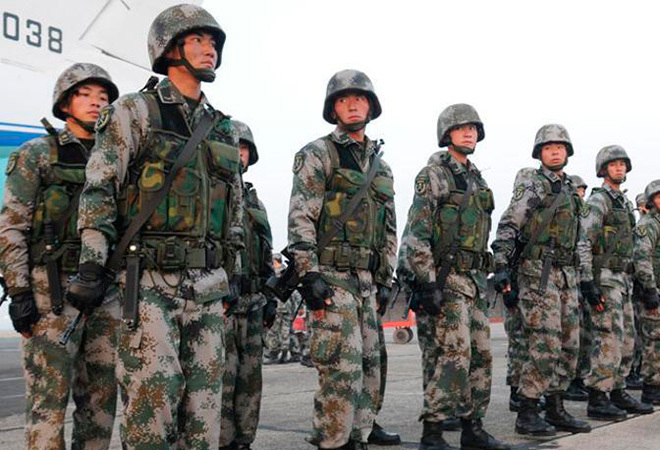 The Chinese People’s Liberation Army (PLA) troops were earlier said to patrol Doklam between April-May and October-November. But now, with the setting up of permanent structures, they are seen set to remain in the area throughout the year. While patrolling the area was said to be aimed at laying claim to the area, a permanent presence of troops is said to signal the Chinese assertion through greater force. In June this year, Indian troops crossed over to the Bhutanese territory and prevented the Chinese from constructing a road there, which was also considered detrimental to Indian security interests in the Northeast. Amid repeated and ominous threats of imminent war from China, the confrontation was eventually resolved peacefully through diplomatic means on Aug 28, ahead of Prime Minister Narendra Modi’s visit to China for a BRICS summit. Following that incident, India’s Army Chief General Bipin Rawat warned, in September, that China would not give up its efforts to nibble at disputed territories through “salami slicing”, muscle-flexing and other measures. While India has “achieved its strategic objective” of not letting China extend its existing road in Doklam, the fallout has been “the almost permanent stationing of PLA troops in the region”, noted The Times of India report. A news has appeared on 11 December 2017 in some newspapers in India to say that some 1600 to 1800 Chinese troops are again camping at Doklam as in December 2017. This news has signaled fears of revival of Doklam issue. While brave Indian forces are ever vigilant to meet challenge , if any , readers may like to know this Vedic astrology writer’s alert for more care and appropriate strategy in hitherto well known article – “ Astrologically speaking , some highlights for India in coming year 2017” – published in theindiapost.com on 19 October , 2017. The related text of the article reads like this :- “ Borders may not be silent. China could deliver a surprise at some strategic location or locations. Continue watch at Doklam”.